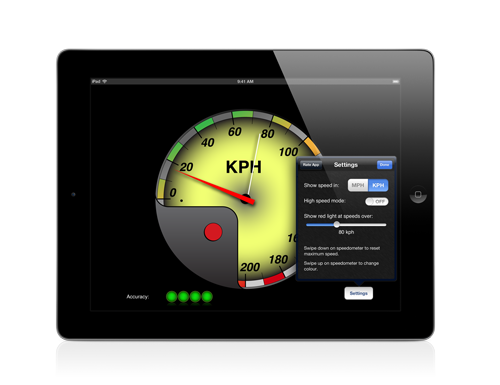 Universal iOS App that displays your current speed on a smooth analog dial. • The white needle records your maximum speed. To reset your maximum speed simply swipe down on the dial of the speedometer. • Four green lights indicate current GPS accuracy, use outside for best results. • You can also set a speed which when exceeded the red light on the dial will illuminate. 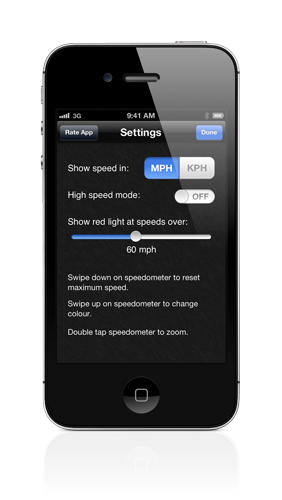 • You can switch easily between mph or kph mode. 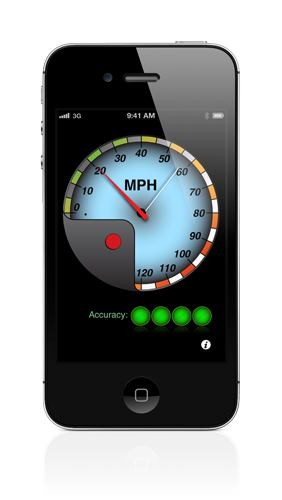 • Double tap speedometer to zoom on the iPhone®. • High speed mode can be enabled from the settings that increases the maximum speed of the speedometer. Normal modes supports speeds up to 120mph/200kph, high speed mode supports speeds up to 180mph/280kph. • Requires a device with GPS and location services enabled. Added option of an audio alert over a certain speed. Added zoomed view on iPhone. Now supports landscape mode on iPhone. Updated to universal app now supports iPad.